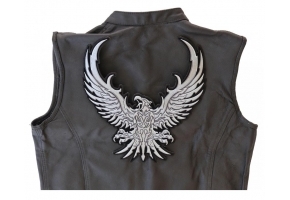 The giant 12x12 inch size Eagle embroidered patch features an upwing eagle drawn in tribal art and embroidered in shades of silver and grey. 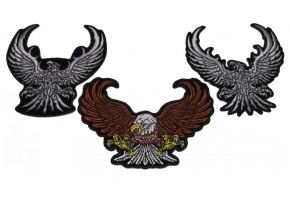 There are a number of different large Eagle Patches out there for those who love these majestic birds, but the Upwing Silver Monochrome Eagle Patch Large is not your normal bird. 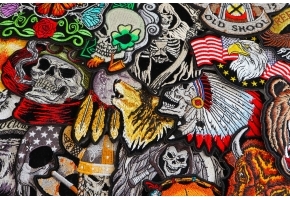 Instead of coming in a multitude of colors, the patch is completely silver. 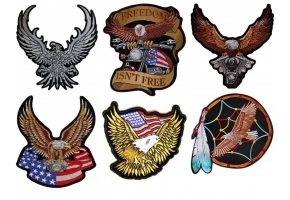 The eagle itself is made up of jagged, almost blade-like wings instead of the soft feathers you usually see on eagle patches. 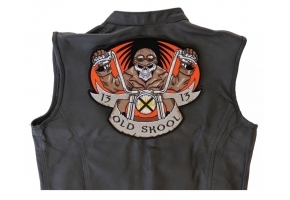 His chest features more tribal art, giving him a jagged, hard look. 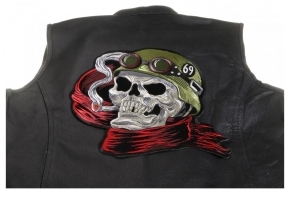 Why add this large back patch to your jacket? 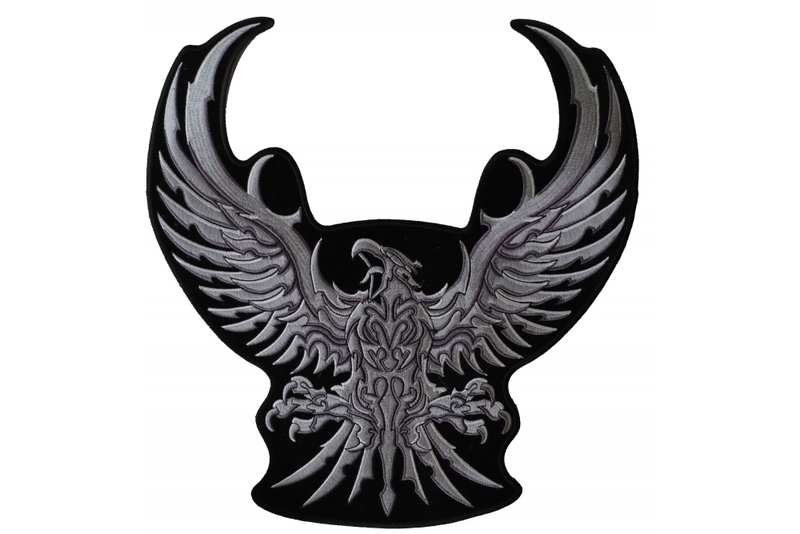 Well, if you like tribal artwork, this is definitely the eagle for you. 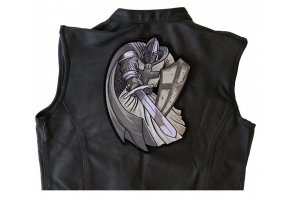 It also looks nice alongside other black and white patches, even though it's more silver and black. If you don't have room for this large eagle, The Cheap Place does have smaller versions available. 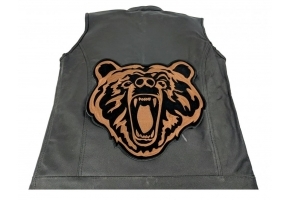 You could even put the large one on the back of your vest and the small one on the front. 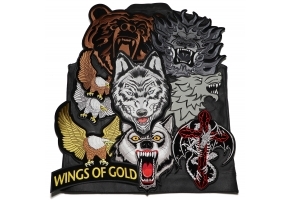 This patch was designed by Arturo Vilmenay, a popular artist who has designed some of the top patches on the site. 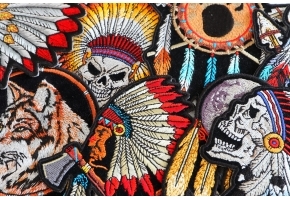 He receives royalties for every one of his patches sold, so not only are you getting an awesome addition to your jacket or vest, but you're also supporting an artist. This large patch measures 12 by 12, although it's not a square by any means. 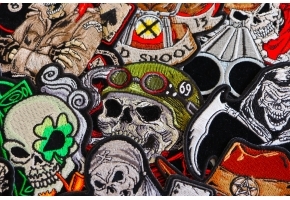 You can fit smaller patches around it. 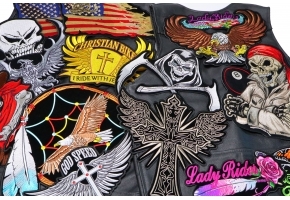 If you're putting the patch on leather, be sure to sew it on. If you're adding it to other types of materials, you can iron it on. 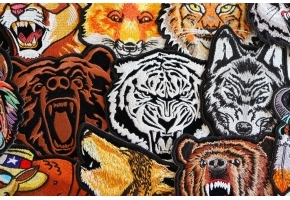 This patch can be used to customize just about anything made out of cloth.